New legions of fans around the world are being introduced to Downton Abbey on a daily basis in a number of ways. Initially broadcast on television, you can now buy the DVDS, catch episodes on Netflix and download your favorite episodes from iTunes. Great fun for new fans but once the two seasons have been viewed, they join the queue with the rest of us for the long wait until Season 3 debuts. We yearn for more romance and glamour of lives lived upstairs and down in grand aristocratic houses in the first two decades of the 20th century. I have been passing the time by faithfully watching along with new generations of fans as the series is rebroadcast here in Canada, and have kept busy blogging about the food of the period. Making my way through the immense last menus of the RMS Titanic certainly required some time. I am also fitting in some period dramas and books. A taste for upstairs downstairs living shouldn’t start and stop with Downton Abbey. While it may be our favorite country house in England, there are other period dramas, and books which will provide a glimpse into the world of privilege and poverty of that era. Lord D and I watched our own copy of War Horse yesterday, which focuses on World War I. Still thinking Downton, it was nice to see Albert’s pal Matt Milne, who play Alfred, a new footman in Season 3. On the small screen a revival of the 1970s series Upstairs Downstairs tried to capture the same feel as Downton, but has just been cancelled due to poor ratings, so perhaps for now mini-series may be the way to go, supplementing, but not replacing a love for the period. Last night PBS delivered Part 1 of 2 of Birdsong, a decidedly less wholesome wartime romance than what we see on Downton, based on the 1993 novel by English author Sebastian Faulks. And then there are the books. I am taking pleasure filling the Downton downtime with reading, and I am the first to admit that it takes some doing to get me into a book since the act of reading isn’t really well suited to multi-tasking, unless you count drinking tea and snacking on cakes. I typically unwind with a nice run, but I have been getting back into reading which I used to enjoy quite a bit. Jessica Fellowes wrote a wonderful book exploring behind the scenes of The World of Downton Abbey which truly is as lovely to look at as it is to read, perfect for those like me who are more visual learners. Check out my review. I have also picked up Lady Almina and the Real Downton Abbey, written by the Countess of Carnarvon, who lives at Highclere Castle where Downton is shot. There are a number of books which gave inspiration to Downton writers including To Marry an English Lord and Below Stairs. In addition, there are a number of new novels springing up to meet the demand of new content from this era. I promised Jessica in a tweet that I would review her book here, and I think the only way I can force myself to read all the books this summer is to start a series of book reviews, with a food pairing. Today I will launch with a great quick read, Wentworth Hall. I mentioned last week that the tea book in the mail from my new friend Ellen helped pick up my spirits after Titanic. On that same day I also received a hard cover book titled Wentworth Hall, written by Abby Grahame. Categorized as a young adult novel, it is set in 1912 and revolves around young lives of men and women who live at Wentworth Hall, a large estate which had been in the Darlington family since the 1700s. And you thought there were secrets in the Abbey . 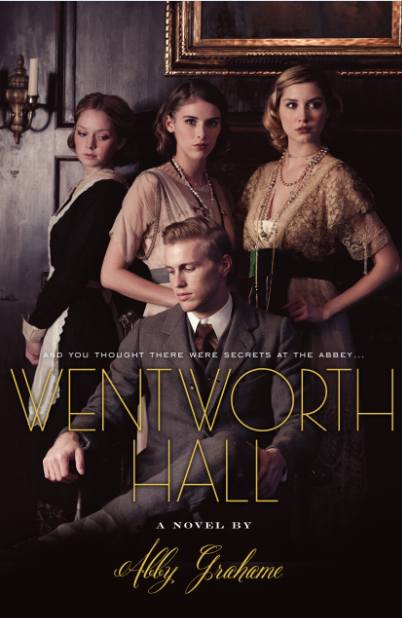 . .
Wentworth Hall is a lush historical novel by debut author Abby Grahame, which is spot-on perfect for fans of Downton Abbey! It was easy for me to read since the book is written for young adults looking for the same type of upstairs downstairs drama that Downtown Abbey provides. The book follows coming of age stories of sisters Maggie and her younger sister Lila Darlington at Wentworth Hall in 1912. We also get a taste of the below stairs lives of the young servants who grew up in the house and played with the Darlington children in their youth. The Edwardian period marks the peak of a thousand years of wealth attained through land, and as we see at Wentworth Abbey, times were beginning to change with land loosing value and self made men with new money appearing on the horizon. Scandals were notorious in this period as King Edward VII, himself had a wandering eye. Since entertaining played a large part of the lifestyle of the Edwardians I was disappointed that there weren’t more dining scenes, and I am not sure if the family would have kept bagels in the icebox for a teething baby unless they or the nanny were Jewish. But minor picky points from a foodie historian. The most enjoyable part of the book is the hilarious “Gossip Girl” satirical accounts written about the Darlingtons, portrayed as the Worthless Family who live at Faded Glory Manor, which is literally falling down around them. So many questions in this book: who wrote the scandalous accounts and sold them to the local paper, who is keeping secrets, and what will become of them all? A good first effort for Abby Grahame; I hope that she will be encouraged to produce more great Edwardian fiction to help younger generations understand what it was like to live in that period. I mentioned last week I had two book prizes to give to the best Titanic hosted parties. There is a connection to Titanic at Wentworth Hall; a visiting young American friend lived next door to the Astor’s summer house. This book will be given away courtesy of publisher Simon & Schuster. Keep those pictures coming in to downtonabbeycooks@gmail.com and I will announce the winners next week. The book will be released in stores May 1st, but you can also order it now through Amazon.com. The Darlingtons are so busy keeping secrets that there is barely any time to eat apparently. Not much mention of food, other than breakfast cooking, Maggie snatching a raisin scone. I will pick and run with the raisin theme and focus on a earlier scene where a kitchen maid is laying apples and raisins into her pie. 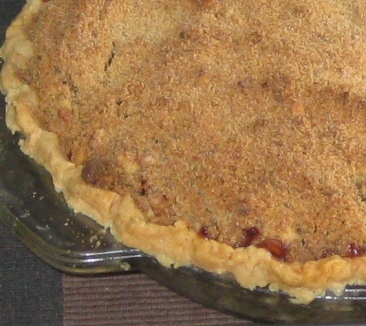 In order to keep the fat content down I often will make a simple crumble or top the pie with crumble instead of crust. This recipe has components of other recipes I have posted, just follow the links. Roll out dough on floured work surface to 13-inch round. Transfer to 9-inch-diameter deep-dish glass pie dish. Fold edges under and crimp, forming crust sides 1/4 inch above rim of pie dish. Mix brown sugar, flour, lemon peel, and cinnamon in large bowl. Add apple slices, raisins, and vanilla; toss until well coated. Transfer filling to unbaked crust, mounding filling slightly in center. Bake pie until apples begin to soften, about 40 minutes. Sprinkle topping evenly over hot pie. Continue to bake pie until apples are tender and topping is browned and crisp, tenting pie with sheet of foil if browning too quickly, about 50 minutes. Cool pie on rack at least 2 hours so the pie will set.